US carmaker General Motors (GM) has told the German government it is still interested in selling European car firm Opel, according to media reports. The confirmation came from a German government official following talks between the two sides in Berlin, both Reuters and AP have reported. On Monday it had been suggested that GM may be set to reverse its decision to sell Opel and its UK unit Vauxhall. The two firms that have bid to buy Opel are Canada's Magna, and Belgium's RHJ. Tuesday's talks in Berlin were held between GM's chief negotiator John Smith, and Germany's Deputy Economy Minister Jochen Homann, plus other members of the government's "Opel task force". No official comments were made following the meeting. Last week, the German government said it would lend Opel 4.5bn euros ($6.4bn; £3.9bn) if its favoured suitor, Magna, was chosen to take it over. However, at the weekend, GM postponed making a decision on who should buy the Opel division, leading to the speculation that it may instead wish to hold onto the European company. 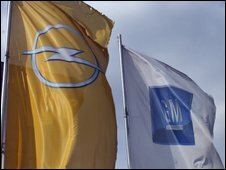 When GM filed for bankruptcy protection on 1 June, it handed over control of Opel to a German-led trust, which will have to approve the final solution. The Opel Trust board has two GM representatives and two for Germany - one for Berlin and one delegate for the four federal states in which Opel has a plant. There is a fifth "neutral" board member - Fred Irwin, president of the American Chamber of Commerce in Germany - but he has no vote. He may, however, be forced to try to broker a deal, analysts say. GM, once the world's largest carmaker, struck an outline deal with Magna in May, days ahead of seeking bankruptcy protection. RHJ, the other bidder, is a financial group. The German government backs the Magna offer because it has promised to cut fewer jobs in Germany, where Opel employs 25,000. In July, GM emerged from Chapter 11 bankruptcy with a number of new US government-appointed board members. On Monday, the White House said that President Barack Obama's "view is that decisions made about the day-to-day operations at General Motors should be made by the folks at General Motors". However, the German government has called on the US government, which now owns more than 60% of GM, to try to speed up the Opel sale process.